Maryam Rostampour and Marziyeh Amirizadeh knew they were putting their lives on the line. Islamic laws in Iran forbade them from sharing their Christian beliefs, but in three years, they'd covertly put New Testaments into the hands of twenty thousand of their countrymen and started two secret house churches. In 2009, they were finally arrested and held in the notorious Evin Prison in Tehran, a place where inmates are routinely tortured and executions are commonplace. In the face of ruthless interrogations, persecution, and a death sentence, Maryam and Marziyeh chose to take the radical--and dangerous--step of sharing their faith inside the very walls of the government stronghold that was meant to silence them. 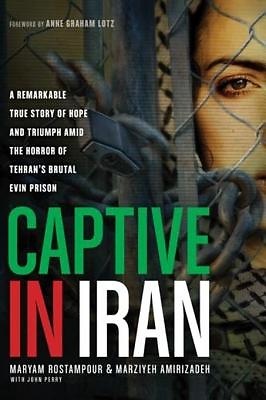 In Captive in Iran, two courageous Iranian women recount how God used their 259 days in Evin Prison to shine His light into one of the world's darkest places, giving hope to those who had lost everything and showing love to those in despair.